I have these matrix #'s on both sides but with the sunrise cloud labels.I don't think you have this one listed. I checked. It also has the same text around the rim along with "Los Angeles California 90028". 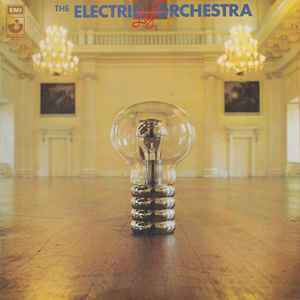 Excellent early ELO Avant Garde Prog Record. I highly recommend it. This press United Artists Clouds Label. With a decent copy Id like to review the overall sound of this album. I was expecting really high quality as it is a first press UK issue, but I was left a little on the fence. The first side especially feels very balanced, almost too much so. Rarely does anything stick out, except when some instruments and even the vocals do the opposite, feeling too recessed. Stereo imaging is very simplistic in the sense that vocals are in the middle most of the time and instruments emanating directly from either speaker. It makes it hard to focus on individual performances of the musicians sometimes, particularly drums on most of side A, and while I admit that some vocals might sound recessed and distorted as an artistic choice it leaves more to be desired. Only on Side B does the dynamics and presence of the music take it up a notch as a whole. I might have sounded overly negative but its again mostly concerning side A which perhaps just was not recorded as well or had different intentions with the music. The experience with this record is still a pleasant one, if you can get it clean enough. The album is focused on the core trio of Roy Wood, Jeff Lynne, and Bev Bevan who were the remaining members of rock group The Move. The Move were still releasing singles in the UK at the same time as this project was undertaken, but interest was soon to be abandoned in Wood's former band. The sound is unique on this recording in comparison to the more slickly-produced ELO albums of the subsequent Jeff Lynne years, incorporating many wind instruments and replacing guitar parts with heavy, "sawing" cello riffs, giving this recording an experimental "Baroque-and-roll" feel; indeed, "The Battle of Marston Moor" is the most baroque-influenced track on the album. On this track, Roy Wood, in addition to playing virtually all the instruments, had to provide the percussion as well because Bev Bevan, normally the group's percussionist and drummer, refused to play on the track because of his low opinion of it. However, the overall musical connection to The Beatles (it had been stated by the bandmembers that ELO was formed to "pick up where The Beatles left off...") is quite apparent in this album; tracks such as "10538 Overture" and "Mr. Radio" were strongly influenced by such Beatles tracks as "I Am The Walrus" and "Strawberry Fields Forever." Despite the experimental nature of the album (or perhaps because of it) it charted on both sides of the Atlantic. The more mainstream "10538 Overture" became a top ten hit in the UK. The original LP was mixed in Quadrophonic sound but was only released in this format in South America. The original album art was designed by Hipgnosis and the photographs of the band on the back of the album cover, dressed in seventeenth century period costume, were taken at the Banqueting House in Whitehall, adding to the Baroque flavor and emphasis on Stuart Britain found on the record. "Mr. Radio" was intended to be the second single from the album, but was subsequently withdrawn. This edition remastered at Abbey Road Studios from the original analogue master tapes by Peter Mew under the supervision of Jeff Lynne. "This is a pretty wacky album, so innocent yet so bold. It goes to some really strange places." ”This was certainly the birth of E.L.O.... I would have to say that together, Jeff and myself made my original dream into a reality. If I am to be honest, I sincerely love him for it." The album was intended to be eponymous, but was mistakenly released in the US with the title 'No Answer'. Someone from United Artists rang the UK to enquire what the title was, but was unable to reach the band's representative. He wrote 'no answer' in his notes, and this was taken to be the intended title of the album. Strangely it's rather a good title. Could have been worse, it could've been called 'Not A Clue' or 'Buggered If I Know'.